Moncler, the clothing company originally founded in France and based around Alpine town Monestier de Clermont, became known for high quality, luxury down jackets and sportswear. Having been bought about a decade ago by Italian entrepreneur Remo Ruffini, who continues as the Creative Director, Moncler continue to design and sell quality quilted jackets globally including a full range of pieces for the youngest fashionista in the form of the Moncler newborn and baby ranges. The newborn range has something a little bit different for parents who want their baby to stand out from the crowd. Not content with regular snow suits the Moncler baby range provides Snowsuit bags that are not only outrageously stylish, but for the cold winter days and nights will provide any newborn baby all the warmth and protection they need. There are stylish jumpsuits with fur lined hoods and detachable belts which come in a range of colours from practical black to totally impractical for a young child (but exceptionally chic), white. There is a full range of quilted jackets including the Aubert, available in red and blue, the fur lined K2 which comes in salmon pink, Ivory and blue and the more feminine Evely available in girlie pink. Coats are also available with the likes of the Justin and the Soizic. 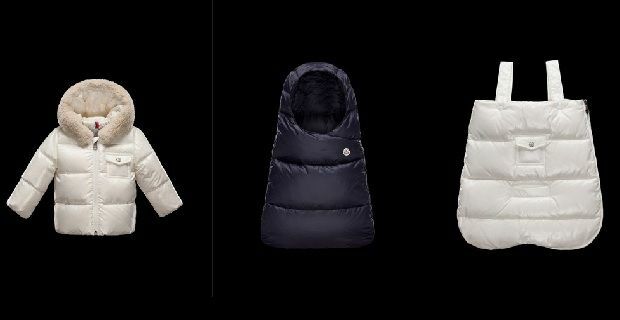 In addition to the traditional Moncler outdoor wear there are baby gilet’s, long sleeve t-shirts, jumpers and two piece outfits. As your baby grows there is the collection aimed at the slightly older child from aged 2 to 6 which features even more stylish padded jackets and coats. Pieces such as the Nadine – a quilted coat in a dark blue or the purple Gerboise padded coat aimed at the girls while for the boys jackets such as the tartan patterned Bady and the more traditional boys winter jacket, the Thomas. There is an even bigger range of gilets and other items such as jumpers, sweat shirts and two piece outfits for the older kids too. For kids the prices are steep given a quilted jacket for a small baby is around the £250 mark but you are paying for luxurious designer wear with a reputation for high quality. If you can afford to splash out for your offspring they are sure to be warm and cosy this winter and the range is ideal if you are hitting the slopes during the season. Why not also check out the adult Autumn Winter 2013-2014 and have yourself fully co-ordinated with your baby! Look great this winter! Don't miss out on the big Moncler sale!